We’d love your help. Let us know what’s wrong with this preview of The Cricket in Times Square by George Selden. One night, the sounds of New York City--the rumbling of subway trains, thrumming of automobile tires, hooting of horns, howling of brakes, and the babbling of voices--is interrupted by a sound that even Tucker Mouse, a jaded inhabitant of Times Square, has never heard before. Mario, the son of Mama and Papa Bellini, proprietors of the subway-station newsstand, had only hea One night, the sounds of New York City--the rumbling of subway trains, thrumming of automobile tires, hooting of horns, howling of brakes, and the babbling of voices--is interrupted by a sound that even Tucker Mouse, a jaded inhabitant of Times Square, has never heard before. Mario, the son of Mama and Papa Bellini, proprietors of the subway-station newsstand, had only heard the sound once. What was this new, strangely musical chirping? None other than the mellifluous leg-rubbing of the somewhat disoriented Chester Cricket from Connecticut. Attracted by the irresistible smell of liverwurst, Chester had foolishly jumped into the picnic basket of some unsuspecting New Yorkers on a junket to the country. Despite the insect's wurst intentions, he ends up in a pile of dirt in Times Square. To ask other readers questions about The Cricket in Times Square, please sign up. What age group is this geared to? Bug My gentle 6yo boy loved this as a read-aloud. All of us writers have so much to learn from this book. If you are not a writer, skip this paragraph. If you are, or aspire to be, a writer, try this exercise: 1. Type out the first few paragraphs of A Cricket in Times Square as you read them. Feel the music in your fingers. Feel the light quickness of the sentences. 2. Turn to the end of the book (if you have read it before! ), and type out the last few paragraphs. Take a moment to feel it again. You have just felt in your own fingers a little b All of us writers have so much to learn from this book. If you are not a writer, skip this paragraph. If you are, or aspire to be, a writer, try this exercise: 1. Type out the first few paragraphs of A Cricket in Times Square as you read them. Feel the music in your fingers. Feel the light quickness of the sentences. 2. Turn to the end of the book (if you have read it before! ), and type out the last few paragraphs. Take a moment to feel it again. You have just felt in your own fingers a little bit of magic. I tried this exercise myself. As an author who previously wrote for adults, I had to learn how to capture the special voice-on-the-wind style that speaks so well for children. There is no better teacher than George Selden. A cat, a mouse, and a cricket. All of them living in a nook at a newspaper stand in Times Square. This book speaks to us on so many levels. Cricket speaks to the child in us, the child that finds the most delight in the little things. (Read this book to a second grader—any second grader—and you’ll see!) Cricket also speaks to the forests and rivers and natural wonders that we carry inside us no matter where we are. Even on the platform of one of the busiest subway stations in the world. Yet the book also speaks to we lovers of cities, with its great mix of cultures (a cat, a mouse, a cricket, all friends? Only in New York.) At last, the book has a lot to say about music. If a child you know is interested in music, give this book to them, and I guarantee a raise of spirits! Indeed, Selden writes so well, that if you listen, you can nearly hear the songs. 3.5 stars. Would have been higher but for the kind of painful portrayal of two Chinese gentleman and of Mario's mother; they felt rather like stereotypes. This was one of my favourite stories as a kid. I read this and "Tucker's Countryside" several times over. The characters are gentle and kind, even somewhat greedy Tucker mouse. Harry cat remains sleek and cool on this reread, which doesn't surprise me as that's what cats are. Charming, sweet, and endearing . . . a timeless juvenile classic celebrating friendship, and learning to embrace challenges by working together to rise above adversity - but yet staying true to one's roots. A lot to like (loved the scenes that depicted NYC in all its glory), but several instances where characters' actions rang a sour note. They acted one way for chapter upon chapter then said or did something that rang completely untrue. Took you out of the story. In a way, it felt almost like a talented self-published author's first publication. There was a lot to like but it was marred by several glaring mistakes that should have been instantly recognizable. Really glad to give this a reread. I read it in grade school, far away from NYC, long before I thought of living here. (Tangentially, I bought this copy at Half Price Books near Iowa City.) I know that absolutely none of the details of New York came through for me then, because they were entirely outside my frame of reference, so I was really curious about them now. Well, 4 stars for the New Yorkiness! It really does a great job, and feels really accurate. A lot of the environment is completely r Really glad to give this a reread. I read it in grade school, far away from NYC, long before I thought of living here. (Tangentially, I bought this copy at Half Price Books near Iowa City.) I know that absolutely none of the details of New York came through for me then, because they were entirely outside my frame of reference, so I was really curious about them now. Because, I have to deduct major points for the entirely unfortunate Chinatown plotline, in which Mario learns that crickets are "sacred" in China and so finds a Chinese person who of course knows everything about crickets -- um, "clickets" -- and wants to give an unlimited number of free things to a random child, and acts like a crazy person a lot. The mispronunciation of Sai Fong's "accent" is just so overboard and not at all how a Chinese person has ever sounded. And at one point, speaking Chinese is described as sounding "like the cheerful clicking of hundreds of chopsticks." It... what? No. It did not. Sadly, cutesy racism dates this story in a much less nostalgic way. This book was dated, written in the 50s I believe, so the old Chinese man in Chinatown spoke with an "l" in lieu of "r"s ("velly" instead of "very", etc.). That was a bit on the not-so-good side and brought this book down a star, but the rest of the book was really quite sweet. There was one scene where I was actually tearing up, but mostly because I was imagining that scene actually happening, that people would all unite in silence and peace at the same moment, and be as one. It was really movi This book was dated, written in the 50s I believe, so the old Chinese man in Chinatown spoke with an "l" in lieu of "r"s ("velly" instead of "very", etc.). That was a bit on the not-so-good side and brought this book down a star, but the rest of the book was really quite sweet. There was one scene where I was actually tearing up, but mostly because I was imagining that scene actually happening, that people would all unite in silence and peace at the same moment, and be as one. It was really moving. Cute book, that I could have sworn I read as a child, but remembered very little of it. There is another book with Chester, "Chester Cricket's New Home", that I could also swear I read as a child. The book cover is familiar at least, but the snippet of it in the back of this book wasn't familiar at all. (sigh) My brain is an Etch-a-Sketch. Once good shake and whatever was in there is gone! I wish I could give this book five stars instead of three. George Selden had a gift for very quickly developing delightful characters, both human and anthropomorphic, as well as writing stellar dialogue. The exchanges between Tucker Mouse and Harry Cat frequently made me laugh, and I found myself sharing some of them aloud with my husband. Garth Williams contributed fantastic art, as usual, and, while each book is totally unique, this combination of story + illustrations is on par with Mrs. Fris I wish I could give this book five stars instead of three. George Selden had a gift for very quickly developing delightful characters, both human and anthropomorphic, as well as writing stellar dialogue. The exchanges between Tucker Mouse and Harry Cat frequently made me laugh, and I found myself sharing some of them aloud with my husband. Garth Williams contributed fantastic art, as usual, and, while each book is totally unique, this combination of story + illustrations is on par with Mrs. Frisby and the Rats of NIMH by Robert C. O'Brien. My wife and I are currently reading this book out loud to our little rascally offspring. When we started, I had a dim memory of the book from when I first read it as a child, ages ago. Selden's style and story stand both the test of time and the test of multi-generational readability. Cricket is a delightful book, written with a gentle touch that shows both affection for the characters and readers. The characters, Chester the cricket, Tucker the mouse, Mario the little Italian news stand boy, et My wife and I are currently reading this book out loud to our little rascally offspring. When we started, I had a dim memory of the book from when I first read it as a child, ages ago. Selden's style and story stand both the test of time and the test of multi-generational readability. Cricket is a delightful book, written with a gentle touch that shows both affection for the characters and readers. The characters, Chester the cricket, Tucker the mouse, Mario the little Italian news stand boy, etc., are wonderfully constructed with a sharp ear for dialogue. 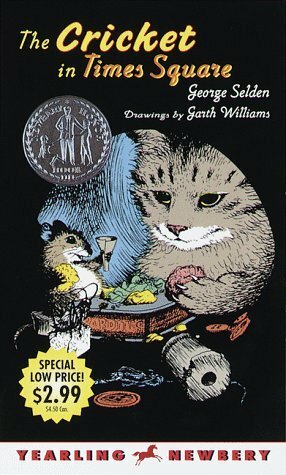 Selden wrote a series of books about these same characters, continuing on with the trio of cricket, cat, and mouse friends. I'll proceed reading the next volumes as my villainous children are just as pleased with this story as I am. By the way, Garth Williams is probably one of the best children's book illustrators in the last century. Though radically different in style, I'd put him in the same class as N. C. Wyeth (stateliness) and Quentin Blake (lovable goofiness). His illustrations in Cricket are a perfect compliment to the story. A truly delightful and heartwarming little tale for all ages. It touches upon themes of homesickness, prejudice, fame and friendship between Chester Cricket and his human and animal friends. The perfect story to read on the plane coming home from a New York City vacation! This is definitely meant for a younger reader, maybe 2-4th grades, but I thought it was such a cute, sweet story of friendship. Reminds me of Charlotte’s Web and Stuart Little. This was one of my favorites growing up and I recently re-read it. Guess what? It's even better than I remember. A great adventure with engaging characters. It's one of the cutest stories I can think of and will always be one of the first several books I'll recommend to a parent looking for a fun read-aloud for her five to eight year old. Attitudes/Disobedience - 2 Incidents: The cricket accidentally eats a two-dollar bill and feels very sad about it. His friend the mouse suggests various ways to hide the incident or to blame someone else to get them in trouble, but the cricke Love. Love. Love. Attitudes/Disobedience - 2 Incidents: The cricket accidentally eats a two-dollar bill and feels very sad about it. His friend the mouse suggests various ways to hide the incident or to blame someone else to get them in trouble, but the cricket says that wouldn't be right. The mouse replies," Oh you're so honorable! It's disgusting." However, the mouse later gives money to help compensate for the lost two-dollar bill. At one point the mother gets very mad because their newsstand burns down. She blames the cricket and rants about this for a time. It's narrated that, "She had found someone on whom she could blame her unhappiness and there was no stopping her." Conversation Topics - 3 Incidents: It mentions a few times that characters smoke a pipe. It references "Nature" once and how she gave the cricket wings. The little boy sees Chinese goddesses (idols) on a shelf in a store and the shopkeeper tells him a story relating why the Chinese think crickets are lucky and how it started with the high gods. A sweet tale about a conscientious cricket who finds himself in New York City and the family that he wants to help for being so kind to him. **Like my reviews? I also have hundreds of detailed reports that I offer too. These reports give a complete break-down of everything in the book, so you'll know just how clean it is or isn't. I also have Clean Guides (downloadable PDFs) which enable you to clean up your book before reading it! A cricket, a mouse, and a cat are an unlikely trio--but that's the primary cast of friendy characters in this book. Chester Cricket is from the country and accidentally ends up in the Times Square subway station in Manhatten. It's there that he meets spunky Tucker the mouse and quiet Harry the cat. Chester is found by Mario, a younf boy who works at his parents newstand. Surrounded by new friends, Chester is excited to see new sights and experience new things. And his friends are thrilled to fin A cricket, a mouse, and a cat are an unlikely trio--but that's the primary cast of friendy characters in this book. Chester Cricket is from the country and accidentally ends up in the Times Square subway station in Manhatten. It's there that he meets spunky Tucker the mouse and quiet Harry the cat. Chester is found by Mario, a younf boy who works at his parents newstand. Surrounded by new friends, Chester is excited to see new sights and experience new things. And his friends are thrilled to find out about Chester's musical talent. Primarily ignored by humans, the three animals enjoy unlikely friendships that will be remembered for a long time. This was a childhood favorite (I still own my original copy!) and I re-read it both to pass off a reading challenge category and because I'd been wanting to remind myself of the story. The cuteness of the story held up well. The only thing that didn't hold up was the stereotyped and possibly racist characterization of Mario and Chester's Chinese friend. Because the Owlet fell in love with Trumpet of the Swan (we read it five times in a row!) I bought her this for Christmas. After one more go round with E.B. White we dove in, me hoping to prove that there is more than one good chapter book in the world. Now I just need a third gentle, excellent chapter book about anthropomorphized animals who are musically inclined. What a delightful story! Sometimes, it really is good to be a kid again. This one really played with my emotions-- happy then sad then happy then sad. A fun read following our NYC trip at Christmas. Great chapter book for little people and fun for mama to reread. For 9-13-ish. I didn't like this book because it was sad when Chester left. It also was sad when Chester stopped giving performances. I think it was cute how the trio of animals kept on having parties even if the humans knew they were. The Cricket in Times Square was one of my favorite books I've read. The book is about a cricket who finds his life in Times Square. Chester is the cricket's name. He is originally from Connecticut, but he got on a wrong train. Also, in the book, there is this kid named Mario. Mario finds Chester in his parent's shop. Mario's mother wants him out, but Mario's father things that Mario should keep Chester. During his adventure in Times Square, he meets Tucker Mouse and Harry Cat. Tucker and Harry a The Cricket in Times Square was one of my favorite books I've read. The book is about a cricket who finds his life in Times Square. Chester is the cricket's name. He is originally from Connecticut, but he got on a wrong train. Also, in the book, there is this kid named Mario. Mario finds Chester in his parent's shop. Mario's mother wants him out, but Mario's father things that Mario should keep Chester. During his adventure in Times Square, he meets Tucker Mouse and Harry Cat. Tucker and Harry are homeless animals that try to find food. Both Tucker and Harry show Chester around Times Square and he likes it there. Later in the book, Chester finds out that he has musical talents. He chirps songs and when Mario finds out, he is surprised that he has a pet that makes music. Chester soon finds himself back home to Connecticut because Mario thinks that he is unhappy. Chester is happy that he goes back home to share his talents. A cricket named Chester finds himself in the heart of New York City’s underground Times Square station after he slipped in a picnic basket back in Connecticut. A young boy named Mario, whose family owns a periodical stand in the subway station, finds the cricket when he hears him chirping late one night. Mario takes the cricket as a pet, despite the argument of his mother, Mama Bellini. While in the subway station he makes friends with an arrogant mouse named Tucker and a mellow cat named Harry. A cricket named Chester finds himself in the heart of New York City’s underground Times Square station after he slipped in a picnic basket back in Connecticut. A young boy named Mario, whose family owns a periodical stand in the subway station, finds the cricket when he hears him chirping late one night. Mario takes the cricket as a pet, despite the argument of his mother, Mama Bellini. While in the subway station he makes friends with an arrogant mouse named Tucker and a mellow cat named Harry. The friends help Chester develop his musical talent and the true luck of the cricket comes when his sweet music brings popularity and income to the Bellini’s small business. End the end, however, Chester misses his home so terribly he must return to the meadow of Connecticut from which he came. I remember reading this as a child and really enjoying it. When I saw the audio on overdrive, I decided that I wanted to revisit the story. And while I wasn't as enchanted by it as I remember my younger self being, it was still an enjoyable story. Chester Cricket ends up in the Times Square subway station after being carried from his home in Connecticut. Here he meets Tucker Mouse and Harry Cat. The three become fast friends and adventures take place. They cam also be quite humorous, particularl I remember reading this as a child and really enjoying it. When I saw the audio on overdrive, I decided that I wanted to revisit the story. And while I wasn't as enchanted by it as I remember my younger self being, it was still an enjoyable story. Chester Cricket ends up in the Times Square subway station after being carried from his home in Connecticut. Here he meets Tucker Mouse and Harry Cat. The three become fast friends and adventures take place. They cam also be quite humorous, particularly Tucker, who is obsessed with saving for his old age. I can see why I would have enjoyed this so much when I was younger. It has interesting characters and moves at an excellent pace. It's not at all believable to my adult eyes, but it wouls have been a nice fantasy for my little girl self. This book was sort of neat, but sort of odd. I didn't connect with the characters in an emotional way. Yes, they were animals, but so was, say, Ralph S. Mouse, who I adored. It was hard for me to muster enough sympathy to feel for these characters. They all struck me as a bit flat. I didn't feel a thing when the cricket stopped singing, or wanted to go home. He was a little TOO good to be truly interesting. The mouse was annoying, and did a lot of bad things, but was never caught or punished. Th This book was sort of neat, but sort of odd. I didn't connect with the characters in an emotional way. Yes, they were animals, but so was, say, Ralph S. Mouse, who I adored. It was hard for me to muster enough sympathy to feel for these characters. They all struck me as a bit flat. I didn't feel a thing when the cricket stopped singing, or wanted to go home. He was a little TOO good to be truly interesting. Oh no! A poor cricket by the name of chester ends up in time square away from his home.But lucky for him a boy named Mario found him and took care of him in a news stand were Chester discovers his true talent.The Cricket in Times Square is a great book that follows the point of view of Chester the cricket and his two friends Harry the cat and Tucker the mouse.I enjoy how it shows detail in every day New York life at the subway and on the streets.I also enjoy how they tie in a Chinese culture in Oh no! A poor cricket by the name of chester ends up in time square away from his home.But lucky for him a boy named Mario found him and took care of him in a news stand were Chester discovers his true talent.The Cricket in Times Square is a great book that follows the point of view of Chester the cricket and his two friends Harry the cat and Tucker the mouse.I enjoy how it shows detail in every day New York life at the subway and on the streets.I also enjoy how they tie in a Chinese culture in the book.The plot was excellent and the story is fun with a good pace. I recommend reading this book its a memorable book that would make you want to read it again! I read this with my 10-year-old, and we both thoroughly enjoyed it! In this day and age of social media and the perception that the number of 'likes', comments, and attention we get are what is most important, I loved the message the cricket gave in this book that his influence to just a few in the meadows of Connecticut was just as important to him as his influence to the throngs of thousands in New York City. A great book to read with your kids! This book was a treat for both my son and me. A neat, clean, heartfelt story. It was ideal for using during a unit study on music, because we would stop whenever a piece of music was mentioned and pull up a youtube video with a recording. That way, we had a fuller experience of the story, and my son got some great exposure to a variety of musical styles. George Selden (1929-1989) was the author of The Cricket in Times Square, winner of the 1961 Newbery Honor and a timeless children's classic. Born in Hartford, Connecticut, Selden received his B.A. from Yale, where he was a member of the Elizabethan Club and contributed to the literary magazine. He spent three summer sessions at Columbia University and, after college, studied for a year in Rome on George Selden (1929-1989) was the author of The Cricket in Times Square, winner of the 1961 Newbery Honor and a timeless children's classic. Born in Hartford, Connecticut, Selden received his B.A. from Yale, where he was a member of the Elizabethan Club and contributed to the literary magazine. He spent three summer sessions at Columbia University and, after college, studied for a year in Rome on a Fulbright Scholarship. People often asked Selden how he got the idea for The Cricket in Times Square. "One night I was coming home on the subway, and I did hear a cricket chirp in the Times Square subway station. The story formed in my mind within minutes. An author is very thankful for minutes like those, although they happen all too infrequently." The popular Cricket series grew to seven titles, including Tucker's Countryside and The Old Meadow. In 1973, The Cricket in Times Square was made into an animated film. Selden wrote more than fifteen books, as well as two plays. His storytelling blends the marvelous with the commonplace realities of life, and it was essential to him that his animal characters display true emotions and feelings.